Rumsey 2905.035 (1860 edition). Phillips (Atlases) 6140, 52-53. 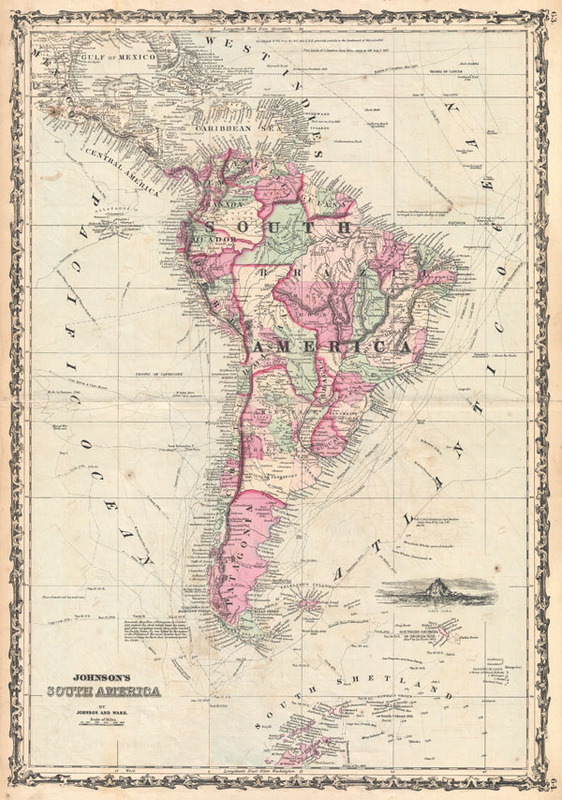 A beautiful example of A. J. Johnson's 1862 map of South America. This large and detailed map covers the continent from Mexico, Florida and the Caribbean south to include South Shetland and parts of Antarctica. Offers superb detail on the South American mainland with a noble attempt to map the great continental river systems. Shows a vestigial though unlabeled remnant of the apocryphal Laguna de los Xarayes (a supposed gateway to paradise and El Dorado) at the northern terminus of the Rio Paraguay. Names numerous indigenous groups, many of which may or may not have existed. In the surrounding seas, Johnson notes the routes taken by numerous important explorers including Cook in 1768, Wallis in 1766, Carteret in 1766, the U.S. Ship Vincennes in 1838, Dr. Halley in 1700, Columbus in 1493, the Spanish Sloop L'Atrevida in 1794, M. Bougainville in 1768, Anson, Capt. George Powell in 1821, and others. References some of the notes from these expeditions regarding the sighting of penguins, whales, sea birds, and kelp. Cartographically this map draws heavily on De L'Isle's important c. 1730 map of South America. We find in remarkable that, in the course of over 130 years of exploration, the interior of South America remained largely a mystery. Exhibits the strapwork style border common to Johnson's atlas work from 1860 to 1863. Published by A. J. Johnson and Ward as page nos. 63-64 in the 1862 edition of Johnson's New Illustrated Family Atlas. This is the first edition of the Family Atlas to bear the Johnson and Ward imprint. Very good. Minor wear and verso reinforcement along original centerfold. Light offsetting. Blank on verso.